The historic area of Southern Baldwin County is the beautiful location where you will find Orange Beach. This area on Alabama’s Gulf Coast was originally settled in the mid-1860s, and the portion of the land that is known today as Orange Beach has continued to grow through tourism as visitors have become drawn to the town’s charter fishing industry. The first hotel built in Orange Beach to cater to the tourists who traveled to the area for the beaches and to rent boats for a day of chartered fishing was built in the 1920s, according to the Encyclopedia of Alabama. Though settlement of the town was hindered by Southern Baldwin County’s poor roadways, the 1930s brought about the completion of the Intracoastal Waterway, which made water travel much easier for locals and tourists alike. The Gulf Coast of Alabama is known for its artificial reef system that stretches more than 1,200 miles into the Gulf of Mexico, including the first artificial reef that started in 1953 right here in Orange Beach. The Orange Beach Charter Boat Association asked for permission to put 250 car bodies in the Gulf, according to the state Department of Conservation & Natural Resources, and the natural growth on the sea floor has taken off, helping provide fishermen with increased access to a variety of fish, including the largely sought-after king mackerel and Spanish mackerel. Fin fishing, which was unavailable until the artificial reefs were built, are plentiful for fishermen seeking to catch shark, red snapper, grouper and amberjack. Beach lovers and avid fishing enthusiasts flock to the Gulf Coast of Alabama for the beautiful waters and enjoyment of a peaceful getaway, and what started in the 1920s is still booming today. The Orange Beach area offers some of the best salt water fishing in the country. With The Triple Trouble, you have a trusted and experienced fishing charter guide in Capt. Chad, who is well educated on each type of fishing and will help guests navigate the waters of deep sea fishing. Booking a charter ahead of time is advised, and there are several options available, including half-day, whole-day and overnight. 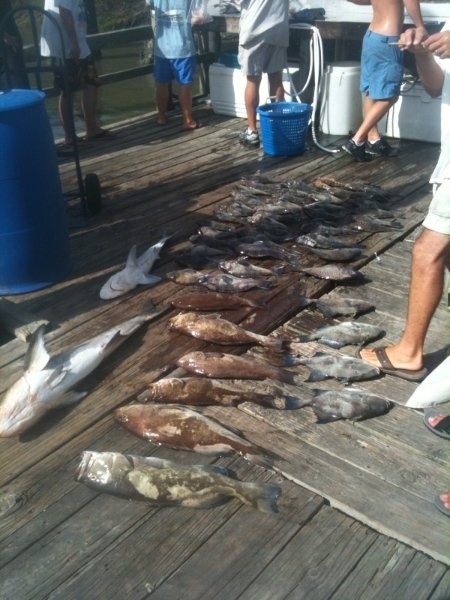 If you are not sure what fishing charter is for you or to book your deep sea fishing charter in Orange Beach, call Capt. Chad today at 256-431-5767.